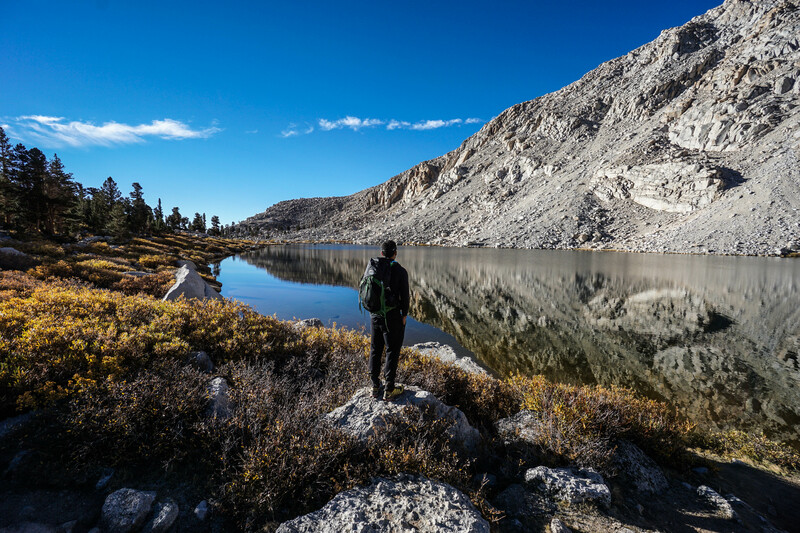 At the southern end of the John Muir Wilderness lies the southernmost 14er in California, Mt. Langley. Driving up from Lone Pine, we started the weekend with a night camping at the Cottonwood Lakes trailhead. The trailhead sits above 10,000ft and allows for a few hours of acclimatizing. There are around 20 campsites, of which only 5 or 6 stood occupied. There is also a section for RVs on the other end of the lot for those with horses using the equestrian center. Even though the parking lot was rather full, the campground was remarkably quiet. We arrived at the grounds around 6pm, set up our tent, and prepared our packs for Mt. Langley. As the sun set, the air grew crisp and cold, and a glowing moon shot through the trees to stand bright overhead. We woke up at 4AM to get an early start on the Cottonwood Lakes trail, we also wanted to time things up to see the sun rise when we arrived at the first lake. It took us a while to get moving as the morning air was freezing. I walked out of the tent first to grab our things from the bear locker when I realized what a spectacular sky shone above me. With the moon buried somewhere safe, the stars lit up and dazzled the landscape. The first seven miles of the Cottonwood Lakes trail is nearly flat, gaining only 1000ft of elevation. It makes for a very pleasant morning walk, winding past the 5 Cottonwood Lakes, sun burnt yellow grass, and silver granite all around. Cottonwood Lake No.1 is the smallest and least impressive of the bunch, it’s also the furthest from the trail. No.2 and No.3 are a lot more impressive and the trail takes you right up to the water. We met a group who had been camping right alongside Lake no.2, and we saw at least 5 or 6 tents around lake no.3, many of which had dogs. Next time we make it out this way, we’ll do an overnighter with Isla alongside one of the Cottonwood Lakes. I can imagine the camping here is spectacular. Lakes no. 4 and 5 appear shortly after climbing out from alongside lake no. 3. The trail splits right between no.4 and no.5 and then heads out onto Old Army Pass. After climbing up from Old Army pass and into Sequoia Forest Area, the landscape begins to take on a moonlike quality, leaving behind the beautiful landscape of colors below. The trail also becomes a bit trickier underfoot. Much of the trail is loose gravel with larger rocks in places, but the trail is nonetheless very easy to follow. The final half mile to the summit is by far the toughest, and not just due to the elevation. The trail fractures and all that’s left to navigate is a series of large cairns. There is no right or wrong way, just the way you choose. Much of the ground is very soft with gravel that gives way beneath your feet. Luckily, there are boulders of various sizes all the way up to rock-hop without having to worry about your footing. If you choose to wear low top shoes without gaiters (like I did), prepare to have a lot of grit to remove once you reach the summit. We reached the summit of Mt. Langley after more than 10 miles and just over 5 hours of hiking. The weather was incredible. It was a pleasant treat after hiking though rain, hail, and wind on our way to the summit of Mt. Whitney three weeks prior. The clear skies and warm air allowed us to take off our packs and take in the views. There were close to 10 people perched atop the summit with similar ideas. It’s rare to get sustained conditions like these above 14,000 feet.